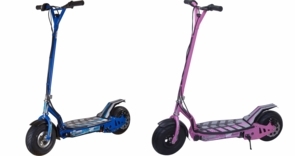 Searching for a reliable and powerful electric scooter for children and adults in blue or pink? You can stop looking as the 300 watt comp scooter for children is extremely durable and will last for years. the 24 volt dual batter system provides super long run times of 10 miles per charge! Holds up to 240 pounds and is recommended for ages 10 and up. Reach speeds of 13 MPH and this amazing electric scooter folds down for easy transport. Rear disc brakes, motorcycle style twist throttle, and 9 inch real rubber tires let you go over grass, dirt, and the street. Choose from blue or pink colors. Yes, we carry all spare parts for this electric scooter to make sure you have years of fun even if you give it away one day to a loved one or friend. Brand new in the box and ready to make your home more fun today!